I have long harboured a realisation which I’ve felt too ashamed about admitting for years, but now I’m going to come out into the open with it. In a nutshell, I absolutely HATE sharing small plates of food with other people – ie tapas style dishes. It really drives me round the bend and ruins many an eating out experience. It just won’t do for me! I think it probably stems from university days. I would be minding my own business eating my beans on toast, or tuna and cheese toastie, and then from out of nowhere my annoying housemate C’s fork would plunge into my plate from across the table as she cheerfully helped herself to my dinner. I would cry out ‘Oi what the hell are you doing’ and she’d retort with ‘Oh stop being so uptight’ while plunging her fork in for a second time with complete impunity. I would feel almost murderous rage at what she’d done – she had violated my dinner. It amounted to a complete lack of respect for my personal space and annoyed the crap out of me. Then began my first forays into Spanish-style tapas eating. I would find the whole process unbearable – people umm-ing and ahh-ing about how many plates of food to order: did we have too much, did we have too little? Then I’d find that the plates that I’d ordered would be placed at the opposite end of the table to where I was sitting, and by the time I’d get it passed to me, someone else would have polished off most of it. 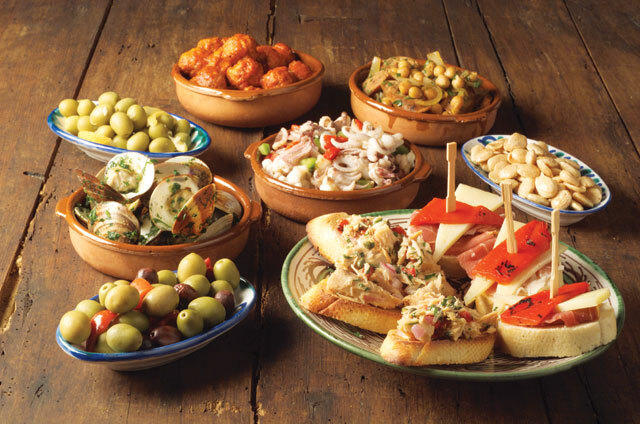 There would never be enough tapas for everyone, but no-one would really speak up and order more. I would find the whole thing an ordeal and leave feeling disgruntled and still hungry, cheated out of a proper dinner. I still can’t get the memory of an unbearable tapas meal I experienced in Bloomsbury out of my head – there were at least 20 people around the table, and tapas is only bearable for two people at most, perhaps a maximum of four, but 20 is sheer insanity. How I hated the ridiculous dance of forks around the last morsel of chorizo or mushroom, and the fact that a lot of the food came in portions that were impossible to divide among more than two people. Spanish tortilla, I rest my case. The only real exception to my dislike of sharing food is in Asian cuisine, where you traditionally order a lot of plates between you and share. It just isn’t really the done thing to order one dish for yourself. For some reason this experience is really satisfying as the portions tend to be larger, and you get to try a lot of different things. (Actually I’ve just thought of one annoying thing: there are four of you dining, but three spring rolls arrive on the plate. Trying to carve them in half with chopsticks is SO annoying!) But I’m afraid tapas, and all those small trendy plates of food that seem to be cropping up everywhere in gastropubs and Soho Italian tapas restaurants just make me feel on edge and perpetually irked. How on earth are you meant to share a soft boiled duck egg and soldiers between four hungry diners? Gah! I love the idea of it but not the practice: you want to order what you like but that gets over-ruled by the popular consensus for extra hot chilli on EVERYTHING or something revolting like curried peanut butter omelette… then when the food you least like arrives it gets devoured by the fastest (and probably fattest) eater who didn't order anything because they are 'on a diet' whilst the chatty and/or polite diner is left hungry! Yes Phil, this is a terrible dilemma. Is there an answer? Simply order more and more food to overcompensate? You're right it's completely annoying.More rants please! I think I am one of those annoying people who wants to share and taste other people's food! But I think you've hit the nail on the head when you say you like Asian sharing because you get nice big portions. Of course it's going to be annoying if there's not enough of it. I just get very un-British and elbow my way to the thing I really want, and then loudly suggest we get a bit more if I'm not full! 🙂 But of course there are some things that aren't meant to be shared – and stealing someone's homemade dinner without permission is just outrageous behaviour! Hmmm – mixed feelings on this one. Sometimes I like to order a mix of dishes that me and a couple (no more than 3 more ppl) of friends will share, and other times I like to have my own food. I can get bored with one plate of food so I welcome the chance to try new things without having to commit to a whole meal of it. At the festival recently someone (the manager of the Crew Bar – you know who it is – begins with a K) leaned over my chair in crew catering and picked a chip off my plate…. with his bare fingers!!! His dirty bare fingers. I was not impressed – he then wandered off and did it again! This time he did not get away with it and MH resoundly told him off before I stabbed him in the heart with my fork. Personally I think that people who take your food without permission have no sense of boundaries and will think nothing of encroaching on you in other ways too.